The author provides a top-notch examination of how indentured servants, privateers, pirates and slaves affected and even directed human history in the age of sail. He doesn’t dwell on famous naval and exploratory voyages; he avoids the usual terracentrism and relies on the sea’s unreal space and the sailors’ yarns that spread news and views. The voyage narrative was a popular genre of 18th-century literature, and it was those tales that influenced writers like Daniel Defoe and Jonathan Swift. 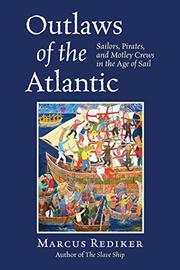 The most interesting thread that weaves through this book and creates the basis for Atlantic history is the effect of the “motley crews.” These multiethnic groups, who patrolled the Atlantic as former slaves, privateers and pirates, had their own self-organization, standards of conduct and even pirate retirement communities. They were what Rediker calls social bandits, men who embodied an enduring phenomenon: peasants’ protests against oppression, poverty and, most importantly, a cry for vengeance. These men fed the seaport crowds with the notion that moral conscience stood above state laws and legitimized their resistance. These crews also helped in the run-up to the American Revolution, including the Boston Massacre. The sailors spread the stories of revolt aboard merchant and slave ships through the Atlantic basin, from Boston to Africa to Saint Domingue to France, fomenting unrest and uprisings.